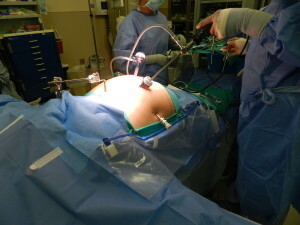 Bariatric Surgery or Weight Reduction Surgery, is known to be the most effective and long lasting treatment for obesity and many related conditions, and evidence suggests it may be among the most effective treatments for metabolic diseases and conditions including type 2 diabetes, hypertension, non-alcoholic fatty liver disease, and obstructive sleep apnea. Metabolic Surgery or Surgery for Diabetes Type 2, may improve insulin resistance and secretion by mechanisms independent of weight loss – most likely involving changes in gastrointestinal hormones. Many patients with type 2 diabetes experience complete remission within days of metabolic surgery, long before significant weight comes off. Type 2 diabetes remission in 76.8% and significantly improved in 86% of patients. Hypertension eliminated in 61.7% and significantly improved in 78.5% of patients. High cholesterol reduced in more than 70% of patients. Sleep apnea was eliminated 85.7% of patients. Joint disease, asthma and infertility were also dramatically improved or resolved. The study showed that surgery patients lost between 62 and 75% of excess weight.